Was The San Bernardino ‘Mass Shooting’ A Double False Flag Event? When nobody thought it could get any crazier (or more obvious) than the fake Sandy Hook massacre, along comes San Bernardino. 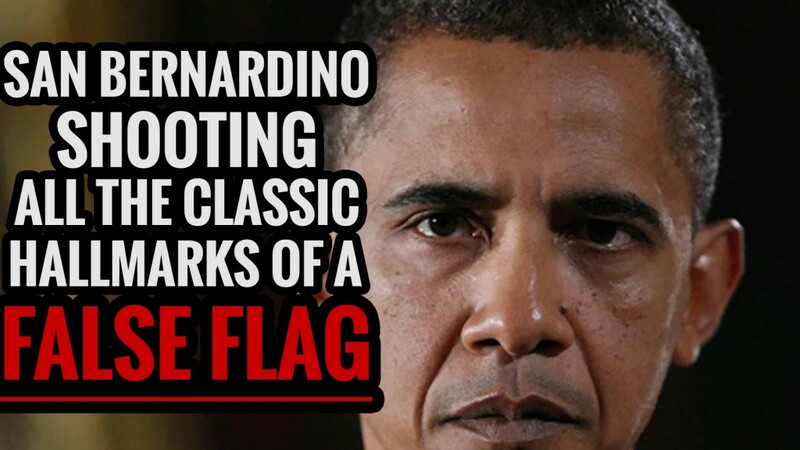 It certainly doesn’t take a Columbo to realize that the San Bernardino false flag is one screwed up case. Just how complicated and confounding this false flag ‘shooting’ is can be better comprehended by the many articles posted at the link below. The official FBI statements and their unusual posturing from the very beginning have left everyone scratching their heads. Obama’s pronouncements and strange responses have been particularly curious and puzzling. While Obama would have been very happy to see the 3 white American militiamen carry out the ‘mass execution’, he seemed too unhappy that the false flag was ultimately pinned on ISIS sympathizers. The Millennium Report has been quite busy thinking about the many anomalies and inconsistencies throughout this inscrutable affair with no success in arriving at any reasonable conclusion(s). Then we were sent a highly credible and penetrating analysis by one of our readers. By simply opening our eyes to the possibilities of two different false flag events taking place on the same day by two separate groups — one with the agenda of limiting our gun rights (the Obama administration) and the other (Patriots) of indicting Homeland Security and other agencies for reckless immigrant vetting process — all of the strange pieces of information for the day begin to fit together coherently. For instance, there have been nine different photos of the bullet riddled black SUV. Each picture is completely different and is pictured in at least three completely different locations. With the slightest bit of scrutiny, we can see with our own eyes different “scenes” where these pictures were taken. There were also numerous pictures taken from unusual angles that indicate that the camera person was already staged to take pictures. One scenario reports that the black SUV was surrounded by numerous police cars and that 36 officers fired over 350 rounds into the car, yet not one police car camera caught a single image. Even the two videos from witnesses showing the “slow speed” chase of the SUV and were not from law enforcement. There have been no videos released of any shoot-out(s) of the SUV. In the first photos released, two bodies were in street clothes, with no apparent weapons near or on their bodies. Only one victim seemed to have a single bullet wound. Then another picture surfaced where one victim has been handcuffed, but with examination, one can see that it does not correspond to other pictures of the victims. The victims are clearly in two different ground locations. In one of the first photos of the SUV, it is parked next to a large blue trash can that is in front of a fence the length of an empty lot. (Really? How many readers take their weekly trash can out that far beyond their driveway?) The trash can seems to be a “marker” of sorts for picture staging. If we just look at the black SUV photos, we can see that in some pictures the hood is up and in others it is down; different windows are shot out; different tires are flat; some pictures have white police cars around them; and others have black police cars or multiple armored vehicles. By simple examination of the photos, the press is either blind, stupid or happy to release evidence that is completely incoherent, misleading and a clear statement that they are complicit in reporting the story line they are given and not concerned with investigating the truth. In two other videos of the black SUV, its emergency lights were flashing as it slowly pulled up to what seems to be a designated spot. You can hear the police report on the dispatcher channel that they are in pursuit of an SUV. Whereupon the driver “jumped from the vehicle and ran off.” This element was reported for two different SUV’s, one was at the scene near the blue trash can and the other was reported to be at an intersection. In yet another incongruent picture of the SUV, we see a police officer standing near a black SUV that has not been shot up. He is bending over and looking in the front passenger side of the vehicle. He has his hand on his gun but it is not drawn. So clearly he isn’t feeling threatened about the situation at hand. Just the examples of the SUV incongruencies show clear evidence of a staged event. But the anomalies seem to be so of control that one wonders what else could have caused the original staged event to get so out of hand that a campaign of disinformation was needed to cover up what really happened. Is it possible that some of the SUV pictures were taken by the Patriots inside agencies, or acting on their own, to create havoc and deflection from the original false flag event? Or could we be witnessing an inter-agency battle going on within our government for the preservation of our nation? Could one agency, perhaps the Federal Bureau of Investigation, be fully aware of another, perhaps Homeland Security-FEMA-Immigration, that has become an enemy within? And being sworn to protect the nation of internal and external enemies, these unseen Patriots are fighting a war unlike any we have seen before? Is it possible that loyal Patriots are countering anti-citizen activities that are being conducted by agencies within our own government? Recently, after the San Bernardino event, a CIA intelligence agent reported that virtually all terrorist false flag events are staged. Another report on the same day stated that an internal battle in the FBI splits the bureau into the 80% that are true patriots and 20% who have sold out to other forces in the government who wish to disarm all Americans. It seems an unlikely coincidence that Obama’s gun control law was being voted on in Congress a day before an emergency drill-false flag operation in San Bernardino was scheduled. Imagine how different the story-line would have been that day if three white males, using automatic and tactical weapons, murdered unsuspecting citizens at a holiday party? Perhaps the administration supported the original false flag event so that anti-gun lobbying would have another “Sandy Hook” to support its efforts for more gun control. Is it possible that a Patriots saw what was about to happen and turned it into a “double false flag” event that made the poorly organized, inexperienced, Muslim patsies into ISIS operatives? If this were so, these Patriot Americans turned the public tides from hating white gun owners into hating Muslim radicals. It would have only taken one Patriot to have implemented the plan to disrupt the original false flag operation, one Patriot that knew Syed Farook and Tashfeen Malik had a sketchy background and could be used in the manner that they were. This one might have been run by government agencies that had an anti-gun agenda. This could be branches directly under White House control such as Homeland Security, CIA (using Israeli, Egyptian or Saudi agents), Department of Immigration, FEMA, ATF or other Federal agencies. The mission was to stage a false flag terror shooting (with concurrent drills in the area) a day before Obama and progressive lobbyists were trying to influence Congressional votes. We have seen three witnesses report three white gunman with assault rifles entering the Inland Regional Center. Some witnesses even reported that they thought it was just one of the routine drills that had been taking place at Inland Regional. Still pending is whether any actual deaths or injuries occurred since there haven’t been any reliable news reports. We haven’t seen any coroner reports. And we have already seen numerous false reports which name so-called deceased as people who did not work for the Health Department that was sponsoring the employee event. It was important that the gunmen be noticed as “white” because later, the anti-gun government proponents would suggest that good-old-boy, white male militia-types, were involved and Americans just aren’t safe. Thus, we need gun control as only the government can protect you! Of course, they will never “find” the three white gunman because they were part of the staged event and after the total screw up of the events that day, they would be wise to remain in hiding. We hear from all of the witnesses outside of the building that the “three white men” did not even bother to wear masks. At the very least, we need to demand verifiable death certificates issued by the coroner’s office. At Sandy Hook, there were never any death certificates issued and a state law was enacted to prevent anyone from making a Freedom of Information Act requesting death certificates of murder victims. The many, many details that are incongruent in this event are explained once we see that there were two false flag activities in play that day. This one was run by true Patriots within the FBI or other agencies that could eventually control the investigative aspects of the day’s events—both false flags. The Patriots knew that false flag #1 was going to happen so false flag #2 was devised to upstage the attempt for the gun control agenda and place on the failures of the American immigration system. On several occasions, we hear FBI Director James Comey indicate that immigrants/refugees are not properly screened and that the FBI does not have enough resources to monitor terrorists within the U.S. And why is it, by the way, that Congress keeps cutting the FBI funding? Without adequate funding how can the FBI monitor all of the poorly-screened refugees and immigrants pouring into our country? The Patriots know the jihadist history of Farook and Malik. Clearly there is plenty of evidence that shows they had connections to terrorism and were being monitored by the FBI to some degree. So this Muslim couple is set up as patsies, who are guilty by association and perhaps related deeds, to take the fall for being the murderers. As soon as false flag #1 goes into play, the Patriots go to Farook’s house and put the husband and wife in handcuffs in the SUV along with weapons, bombs, and all the evidence needed to convince everyone they were the killers. Malik’s supposed Facebook message about her new commitment to ISIS may have been done by her under force or by the person who came to her home. This message, sent during the time of the attack on the Christmas party supposedly confirms her current activity with a terrorist operation. Once the Patriot has the couple in the vehicle he drives around until the police “see the vehicle driving slowly by Farook’s apartment.” Then, the SUV driver drives slowly for two miles, with the emergency lights flashing, back towards the crime scene at the Inland Regional Center. At a designated spot, the SUV stops and the Patriot (who is the driver) gets out of the vehicle, shoots into the air, and runs away, never to be pursued or caught. Supposedly at this point, the “terrorists”, who are handcuffed, shoot at the police. Law enforcement (36 police), believing the SUV to contain the shooters from false flag #1, open fire on the SUV. However, it is really not possible to tell whether the Muslim couple were shot in the SUV by police or ahead of time by someone else. The many and various pictures of the shoot-out scene were possibly staged before false flag #2 went into play. Another seemingly gross error concerning the case is the “crime scene” at the couple’s house (also called apartment by some accounts). The house was left unsecured after the FBI “investigated” the scene. Perhaps it was left unsecured because the false flag #2 planners within the FBU knew it was not a crime scene. It was a decoy so that media would find a list of so-called “taken items” from the FBI investigation. No one will ever know if these items were ever found in the Farook house. Now that the crime scene has been riffled through by man and dog, it is tainted and can never be used for trial purposes. This, along with the slaying of Farook and Malik, leaves the entire matter without witnesses or evidence and makes the case essentially closed. Anti-gun government operatives can’t really tell the truth because they were staging false flag #1 for their anti-gun agenda and the “survivors” that were interviewed at the Inland Regional Center were crisis actors. Of course the president won’t be attending these funerals or acknowledging those who died because he knows that no one died in San Bernardino, just like at Sandy Hook. Is this what Jade Helm was really about? It is logo says it all: “Controlling the human domain”. Are other Jade Helm and anti-citizen agencies ready to launch other false flags against us? Perhaps to create civil unrest, leading to martial law, and possibly a suspension of the presidential elections? If so, the evidence will make itself known to all of us over the next year. Did you notice the United Nations markings on Jade Helm military trucks and vehicles this summer as they were crossing America? And, by the way, has anybody seen these vehicles go in the opposite direction since the Jade Helm exercise was supposedly over on September 15, 2015? Listen carefully to FBI Director James Comey and the other FBI spokespeople. They clearly say that this was an act of terrorism. But they don’t say it was “Muslim” or “ISIS” terrorism. Perhaps it is an insidious terrorism of the worst kind—our government terrorizing its own citizens through false flag events that are staged to coerce Americans to give up their guns, their liberty, and way of life to the globalists. If any of this “false flag within a false flag” hypothetical argument is true, then God bless the Patriots that are working within our government to protect our country.